Seen here around 8 pm on February 22 from mid-northern latitudes, the planet Saturn is now at its best in our late-winter sky. Saturn is now at its best in our late-winter sky. 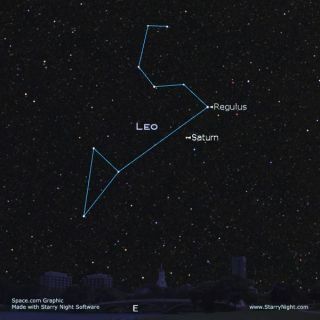 It appearsbelow and to the left of the conspicuous "sickle" or backwardsquestion-mark pattern of stars marking the head and mane of the constellationof Leo, the Lion. It will arrive atopposition to the sun Feb. 24, when it lies on the opposite side of the skyfrom the sun; rising as the sun sets, reaching its highest point in thesouthern sky at midnight and setting as the sun rises. What we see with the naked eye is a bright yellowish-white "star"shining with a steady light. Through a telescope this object is enlarged intoone of the finestshowpieces of the night sky, thanks to its great ring system in all of itsicy, glimmering elegance. In small telescopes, the rings surprise even veteranobservers with their chilling elegance even though it is expected. Certainlythey will delight anyone this winter who received a telescope as a holidaygift. Any telescope magnifying more than 30 power will show them. Take a look at Saturn's rings now, because soon our view ofthem will be compromised by the fact that they are turning more and moreedge-on to our line of sight. Currently the rings are tilted at just over 8 degrees towardus and actually, they will appear to open slightly to nearly 10 degrees by thebeginning of May. However, later this year, the rings will appear to rapidlyclose up and by the end of this year the tilt of the rings will be less thanone degree and they will appear as nothing more than a thin line bisecting theball of the planet. And by the late summer of 2009, there will come a period oftime when the rings will appear to vanish, as they will be turned exactlyedgewise to us. At an average distance of 886 million miles (1.43 billion km. )from the sun, or about twice as far away as Jupiter, Saturn goes around the sun once in 29.5Earth-years. Second only to Jupiter in size at 74,900 mi (120,500 km), it'smore than nine times the size of our Earth. Like Jupiter, it's wrapped in thickclouds which run in parallel bands across its disk. At last count, Saturn has 61 satellites; the largest one,Titan, appears as a star of eighth magnitude and appears to orbit Saturn in about16-days. But the really impressive feature of Saturn is its famousring system. These rings are not continuous sheets, but are actuallycomposed of countless billions of particles which range in size frommicroscopic specks to boulders the size of houses, each one circling like amoon around Saturn and reflecting sunlight. Most of these are composed of waterice. Through a good-sized telescope the rings appear as twobright ones with a narrow dark space between them — called the Cassini Division,discovered in 1675 — and the fainter "crape ring" nearer to the ballof the planet, which is not quite so easy to see. These are considered the MainRings and measure about 170,000 miles (273,500 km.) across, although over thepast 30 years several other much fainter rings have been identified from imagestaken by the Pioneer 11 and Voyager space probes. These are referred to as theDusty Rings. The width of the entire ring system, including gaps, isabout 258,500 mi (416,000 km). Galileo Galilei (1564-1642) was the first to view therings in 1610 although what he saw through his crude telescope left himcompletely baffled, as Saturn appeared to him not to have rings but rather twosmaller bodies flanking it on either side. He couldn't make them out clearly and thought that Saturnwas a triple body, with two small orbs on either side of a large one. Later,when the rings turned edgewise to Earth and the two companions disappeared,Galileo invoked an ancient myth when he wrote, "Has Saturn swallowed hischildren?" Galileo lamented that his mind was too weak to comprehend thisstrange phenomenon. Actually, it was his telescope that was too weak; a bettertelescope would have revealed Saturn's companions as rings. It was not until a young Dutch mathematician, ChristiaanHuygens (1629-1695), utilized a much better telescope, and on March 25,1655 saw the rings for what they really were. In mythology, Saturn closely resembled the Greek god Cronus,but he's more usually recognized as the Roman god of agriculture. The name isrelated to both the noun satus (seed corn) and the verb serere (to sow). But why would the planet Saturn be linked to agriculture? Perhapsa clue can be found from the ancient Assyrians who referred to Saturn aslubadsagush, which translated, meant "oldest of the old sheep." Possiblythis name was applied because Saturn seems to move so very slowly among thestars; it may have also reminded sky watchers of the slow gait of plowing oxenor cattle. So, if we identify Venus by its great brilliance, Mars byits orange-yellow color and Jupiter which is surpassed only by Venus inbrightness, then Saturn is recognized by its slow movement among the stars, andeasiest of all, if we examine it through a telescope, by its beautiful rings.